Event Description National Watercolor Society and Oceanside Museum of Art: Southern California Inspirations, Past and Present. 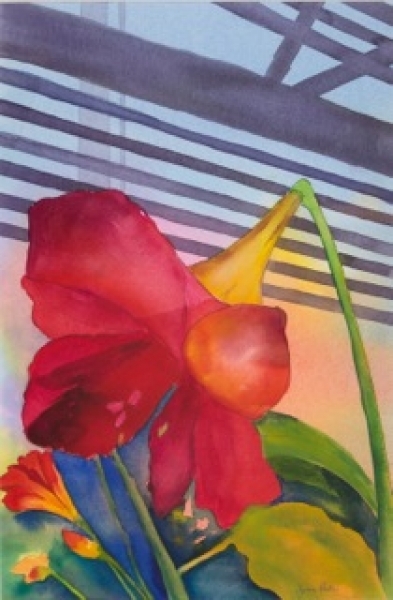 Artist June Rubin�s watercolor "Balboa Arboretum Amaryllis� on exhibit Event Dates:�12/22/2018 - 4/21/2018 Reception:�2/23/2019, 6-8 PM � Museum Open Hours: Tuesday, Wednesday, Saturday 11am-5pm, Thursday, Friday 11am-8pm, Sunday 12-5pm Website:�http://oma-online.org� A special exhibition of selected paintings from current National Watercolor Society's Southern California artists,�plus curated works from past SoCal-based NWS members including well known artists Millard Sheets and Rex Brandt. June Rubin's artwork "Balboa Arboretum Amaryllis" was selected by internationally known artist and art juror Ken Goldman for this invitational show, on view.